A Bunion is a common foot complaint, which involves the big toe joint slowly deviating from its natural position. The condition will typically present as a bony bump below the base of the big toe that protrudes outwards from the foot. Bunions often develop over a long period. They are progressive, meaning that without intervention a Bunion will get worse over time. A Bunion will typically first appear as a mild bump below the big toe that protrudes out from the foot. As it develops the bony bump may become more severe, causing irritation in footwear, redness and inflammation. As the joint deviates further, the big toe may start to underride or overlap the adjacent toes, causing further issues and painful symptoms. There are many basic ways of conservatively treating Bunions, often these aim to relieve painful symptoms and prevent the Bunion from progressing. Tight fitting shoes can aggravate Bunion symptoms. Rubbing and pressure from the shoes may lead to crowding of the toes, as well as corns and calluses. Shoes with narrow toe boxes, such as high heels, can make the Bunion deformity worse. A sensible first course of action will be to use shoes with wide toe boxes, so as to avoid exacerbating painful symptoms or fast progression of the condition. Bunion toe straighteners are a conservative treatment option that may be helpful in reducing painful-symptoms. These devices work by separating the big toe from the other toes and cushioning the bony Bunion bump to prevent irritation. There is no medical evidence to suggest these devices will resolve Bunion complaints, but they can be a useful way to relieve symptoms and prevent progression of the condition. Understandably, many people prefer to avoid surgical treatments. Conservative treatments are almost always recommended in the first instance, and simple measures such as wearing sensible shoes or using pain-relieving splinting devices can help manage the condition. However, Bunions are progressive and will inevitably get worse over time. Surgery is currently the only treatment option for fully resolving a Bunion complaint. Traditional Bunionectomy – A Bunionectomy involves removal of the enlarged lump at the big toe joint. The surgeon may correct the tendon or ligament balance that initially gave rise to the Bunion in order to improve alignment. This procedure is generally recommended for very minor Bunion deformities in elderly patients where the bony bump is the main problem and the alignment operation is not advisable. Scarf & Akin Osteotomy – The Scarf & Akin procedure is used to treat moderate Bunion deformities. It allows for fast weight-bearing due to the stability of the specialised bone cutting techniques and titanium screws, which are used to correct the bone alignment. This is one of the most popular forms of Bunion operation globally. 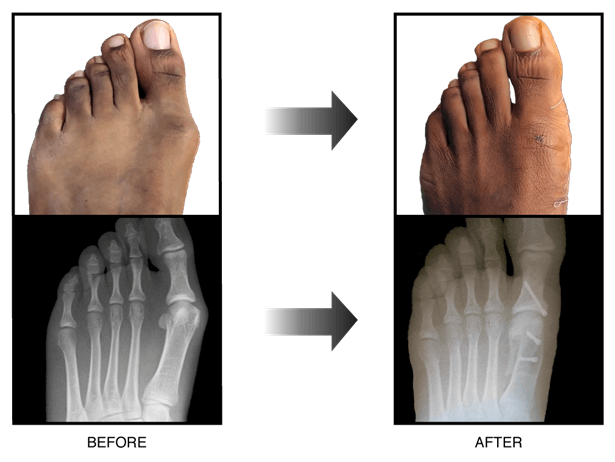 Lapidus Fusion Procedure – The Lapidus procedure aims to correct two bones near the arch of the foot, which because of their flexibility have lead to the Bunion developing. The Lapidus procedure is generally recommended for patients who have painful moderate to severe Bunion deformities, often when the Bunion is associated with hypermobility. Often surgical screws are used to keep realigned bone in place after the operation. Normally these will stay in place permanently, as they are benign and are thought not to warrant further surgery in order to remove them. However, in the minority of cases the screws can become irritating or cause swelling in the area and in such cases the screws may be removed once the bone has healed. What Is The Best Surgery For Bunions? There is no ‘Best’ surgery for Bunions. Surgical techniques develop over time, as new treatments are discovered and improved, or technology advances. 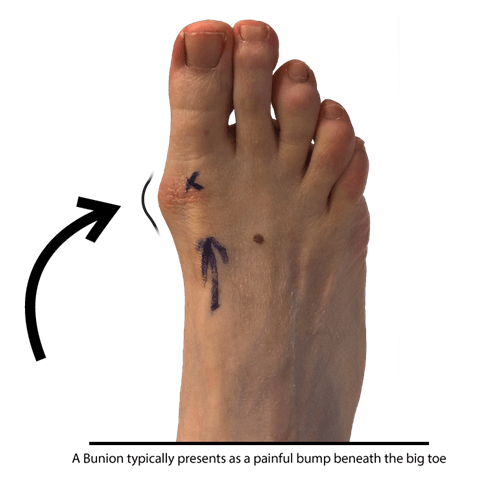 A surgeon will usually be aware of many procedural options to treat a Bunion, but they will often advise on a particular surgery that is suited to the patient. A surgeon will often provide detailed information on the operation that they recommend so that an informed decision can be made by the patient. Minimally Invasive surgery makes use of techniques that reduce the number and size of incisions required to resolve the Bunion. This has the benefit of lessening tissue damage and scarring following the procedure.There are a range of Minimally Invasive techniques, sometimes these are developed or performed only by specific surgeons. How Much Does Minimally Invasive Bunion Surgery Cost? It can be helpful for those who are considering surgical options to compare the condition before and after surgery. Surgeons will often provide details of the differences a patient could expect, particular areas of improvement and aims of the surgery. They may also provide pictures to showcase the successfulness of their surgical techniques in past cases. Bunion surgery is often very successful and can fully resolve the condition. With minimally invasive techniques you can expect little scarring, generally you can expect improved cosmetic appearance and symptom-free improved functioning of the foot. Recovery from Bunion surgery normally takes roughly six to eight weeks, although full recovery can take four to six months on average.